Fruits and Vegetables are arguably the most nutritious foods you can eat. When they are readily available they should compose at least half of our daily diets. What happens when they become scarce? What happens if it’s winter and we have no garden to rely on? Then we look to preserved versions. 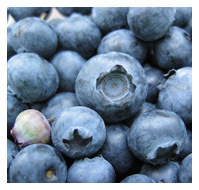 The very most nutritionally sound method of preserving fruits and vegetables is freeze drying. In this process foods are first flash-frozen; then the moisture is drawn out—leaving virtually 100% of the food's nutritional value intact. 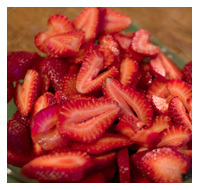 Freeze-dried fruits and vegetables last indefinitely when stored in airtight containers. They reconstitute almost immediately but are delicious to snack on even without rehydration. A great option—but pricier than the alternative below. 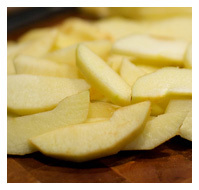 Dehydrating Fruits and Vegetables is a process that can be done at home with the correct equipment. It’s not hard! Dehydrated vegetables can store for very long amounts of time, but dehydrated fruit is not quite as shelf-stable. 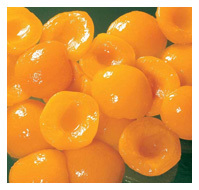 We sell a wide variety of high-quality dehydrated fruits and vegetables. Dehydrated fruit can be eaten as-is. Dehydrated vegetables take some time to reconstitute, but the price tag is a little friendlier than the freeze-dried option. Throughout the year, and especially in the fall, we bring in truckloads of fabulous fresh produce! 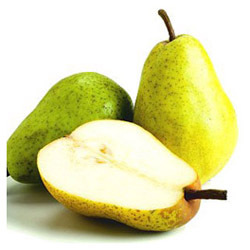 Award-winning Bartlett Pears from Medford, Oregon—best pears in the world! 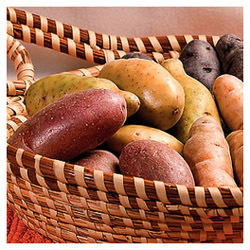 Russet Burbank, Yukon Gold, Red and Shepody Potatoes from the Potato Capital—Idaho! 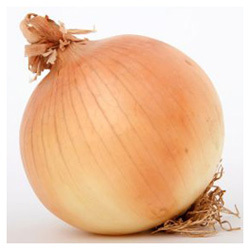 Spanish Sweet Onions—from Treasure Valley, Idaho! Fuji Apples—from Washington State, famous for raising the best apples in the nation! We also bring in fresh tomatoes and peppers locally for those who don’t have a garden. Sometimes we find a great deal on peaches or winter squash. To find out about these fantastic orders, sign up for our email list below! This is one order where your presence at delivery is mandatory! I have NO freezer space to store these orders! :-) We are ordering individually frozen berries and fruits from Oregon. This order is only open three times per year—in the spring, summer and fall. Watch the website or subscribe to this thread for deadlines and updated pricing. 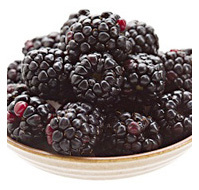 The fruits and berries are wonderful for smoothies, cobblers, pies, and much more. These come in a 14-lb box. They are individually frozen so it's easy to either pull out just a few at a time or repackage them into smaller freezer-storage baggies. Also available is frozen jam, made with fresh, NOT COOKED, fruit! Fantastically delicious! These are available in cases of twelve 1-lb tubs. Or the gift pack has one 10-oz tub of each of the six flavors so you can try them and see what you like for the next order! This company also offers a wide variety of Fresh (not farmed) seafood from off the Oregon Coast! Seafood is only available in the spring and fall. 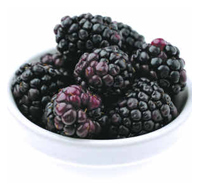 These are our most versatile berry, large in size and rich in Blackberry flavor. 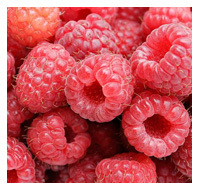 Our Meeker Raspberries are excellent in flavor and are the best we have found for the fresh-frozen Raspberry lover. Boysens were developed in California. Our Oregon-grown variety is large, plump and delicious. Oregon Blueberries are very large. Try them with cream and sugar, in pies, cakes and muffins or like candy from the freezer. Sliced with Sugar: Sugar is added to these sliced berries—4 parts berry to 1 part sugar—to help preserve their luscious flavor and texture. 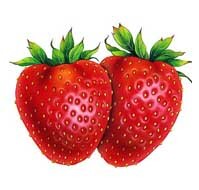 Sugar-free whole strawberries are also available. 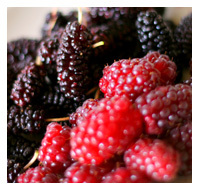 These flavor-rich, large, red, tart Loganberries are a traditional favorite. They make outstandingly delicious jams, jellies and pies. 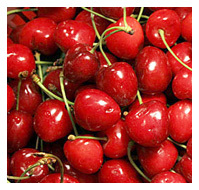 These are fantastic, individually quick-frozen, pitted, red in color and superior in quality. These are naturally sweet, pitted, individually quick-frozen and ready for eating, sauces, desserts and jam. 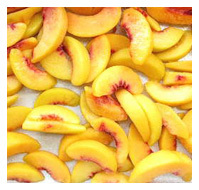 Beautiful IQF Peach slices are picked Firm Ripe primarily for baking and preserves. 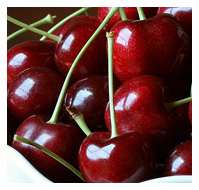 They are not the Soft Ripe consistency, which tends to break down when cooked. Each half is individually quick-frozen (IQF). They are yellow/orange in color with sweet, juicy flesh. A timesaver for the apricot lover. 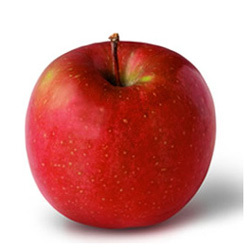 Ready to use for your favorite apple recipe. No core, no peels. They're ready when you are. 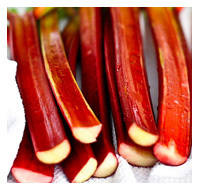 Crimson-red Rhubarb, put in individually quick-frozen, half-inch slices, is ready for sauces, pies and cobblers. 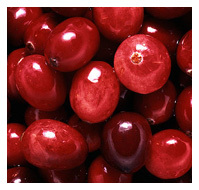 These festive red berries are a colorful ingredient in breads, muffins, sauces and pies.